Here is another great example of how one can use sports as an organizing tool. 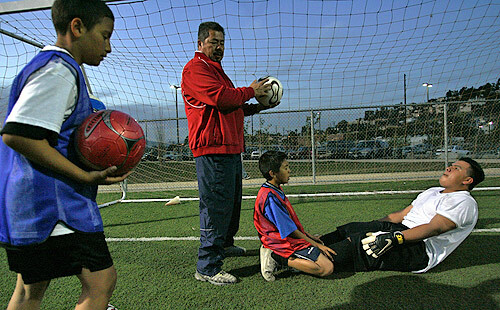 In a recent Los Angeles Times article, Raul Macias, organized a soccer league but when he could not find soccer fields he entered the realm of politics. His first confrontation was with the L.A. parks and recreation department which essentially told him to “learn English” and “go back to Mexico,” but Raul was persistent in helping out the kids by keeping them out of trouble and involved in soccer. After securing soccer fields with his political maneuvering and organizing a group of parents and soccer players, Juan became a political activist to be reckon with, attracting politicos, environmental activists, and city officials seeking his advise and support. I was reading the L.A. Times editorial about new estrictions on Taco Trucks in the L.A. area and was thinking about why I prefer taco trucks over full service Mexican restaurants. Apart form the more intimate connection between the cook and customer, I enjoy the conversations around the taco truck. I meet all kinds of people that I would have never met before. I like the quote” the crowd around a taco truck is the closest thing we have to a unified Los Angeles soul.” In thinking about my new favorite taco truck in Pullman, WA it is the only place where I see so many Latino families in one location waiting for their orders and speaking Spanish. It is rare to find a public space in Pullmania where Spanish is flowing so freely. But if you look closer it is not just Latinos who visit the taco trucks, people from different nationalities love Mexican food but also enjoy the “taco truck experience.” I would argue that Taco trucks are important cross-cultural spaces where Latinos and non-Latinos meet, talk and build community ties. The reality is the “taco truck experience” is a contested space. 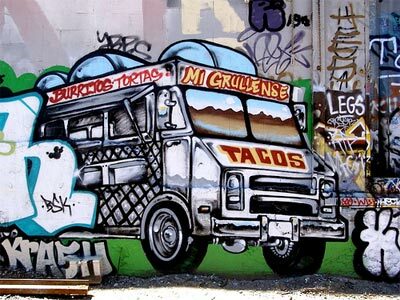 Restaurant owners, neighbors, law enforcement and city officials view the taco trucks as an economic and community threat, but customers and supporters need to advocate on their behalf. Ironically it often Latino retaurant owners and politicians who are supporting these strict regulations and heavy fines. O.k. now I’m hungry and ready for another taco truck experience. I was wondering why some of my Latino/a students were absent from class on Wednesday. Now I know why? They attended the Mexico v.s. China soccer match in Seattle. According to the Seattle Times there were 56,415 fans at Qwest Field cheering on their homeland team, but the loudest and most passionate were Mexico’s fans. As the China team coach put it, “I think the public for Mexico is like a 12th player. So I think they got very motivated.” Supporting Mexico’s national team becomes a way for many immigrants to “imagine” their homeland and show off their national pride, and because they are farther removed from the border (tucked away in the pacific northwest corner), the match took on a greater importance. I wonder whether large number of Latino fans who attended the match caught the attention of Major League Soccer and Seattle Sounders officials. To date there is no Latino player in the Seatle Sounders roster. Does this matter? Perhaps not since the love of soccer will attract fans of any culture. But I think having some Mexican players in the Sounders, especially star players from the Mexico soccer league team, will draw more attention among Latino fans. 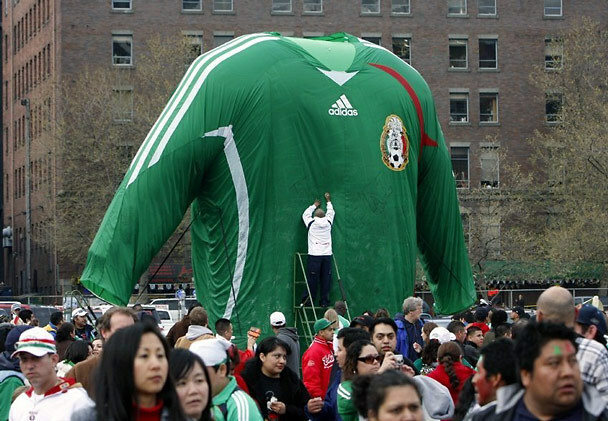 While its not clear what the future holds for soccer in Seattle, one thing was made clear and visible on Wednesday April 16, and that is Seattle became “Mexican Seattle” for one day. Last year I attended the Cinco de Mayo festival in downtown Portland. This four-day festival featured amusement park rides, food booths, art and crafts, basketball tournament, and musical entertainment. This annual event has been organized for 24 years by the Portland-Guadalajara Sister City Association. I was impressed by the variety of cultural offerings that incorporated educational and political components. For example, during oen of the days they held a Naturalization Ceremony in the main stage which featured new U.S. citizensh proudly displaying their naturalization certificates (I wonder how many had dual citizenship). The group provides student scholarships under the Somos Orgullosos Latinos Scholarship Program and Cesar Chavez Leadership Scholarships. I encourage everyone to attend to see for themselves. Taco Bell is returning to Mexico. 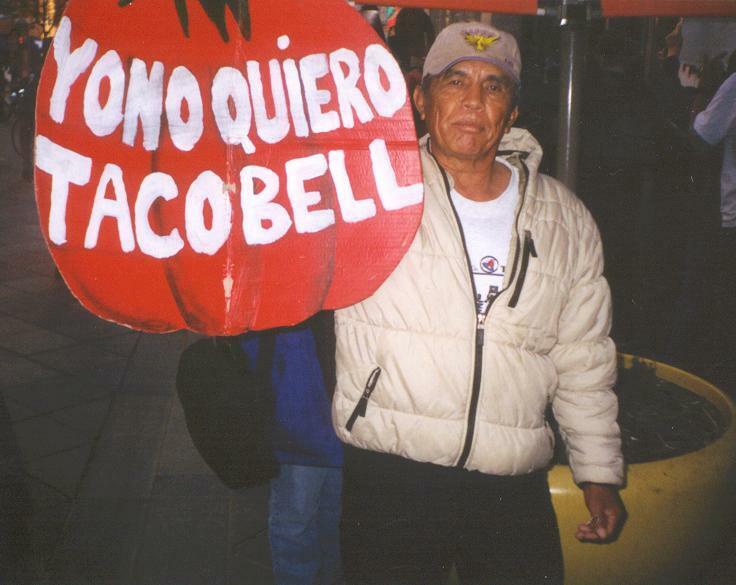 Fifteen years ago Taco Bell attempted to enter the Mexican market but failed. Now the company is trying a new marketing strategy. Taco Bell does not proclaim itself as “taqueria” that sells authentic Mexican tacos, rather they sell American fast-food style “tacotostadas” (folded tostadas) with french fries. Despite this item menu change the company still sells gorditas, burritos, and chapulas and has not changed its name to “Tacostostada Bell.” Many Mexico residents are offended that Taco Bell is once again running south of the border and “conquering” the “taco,” a staple of Mexican cuisine. This move represents another threat to Mexico’s food sovereignty. Mexico is unable to grow the food staples—beans, corn, and rice—because under the North American Free Trade Agreement U.S. farmers import them for cheaper prices thus undercutting homegrown prices, killing the countryside, forcing farmers out of business and migrating to the United States where they find employment in fast food outlets like Taco Bell. 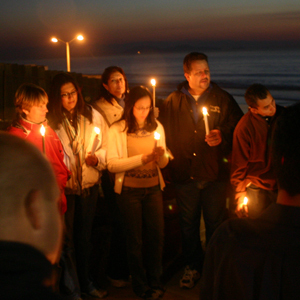 Last December the National Coalition for Dignity and Permanent Residency organized a traditional religious celebration called “Las Posadas” (which means “shelter”) but with a new twist. This celebration honors Mary and Joseph’s journey from Nazareth to Bethlehem in search for shelter and takes place during the Christmas season. This group reinterpreted the celebration to bring attention to the struggles of immigrant workers in the United States. Members dressed up as Mary and Joseph, shepherds, sang traditional songs and walked to the local offices of Senators and Representatives from Congress, to call attention to the plight of immigrants who are also in search of “shelter.” This is a great example of how cultural and religious celebrations can be infused with social relevance and a political message.